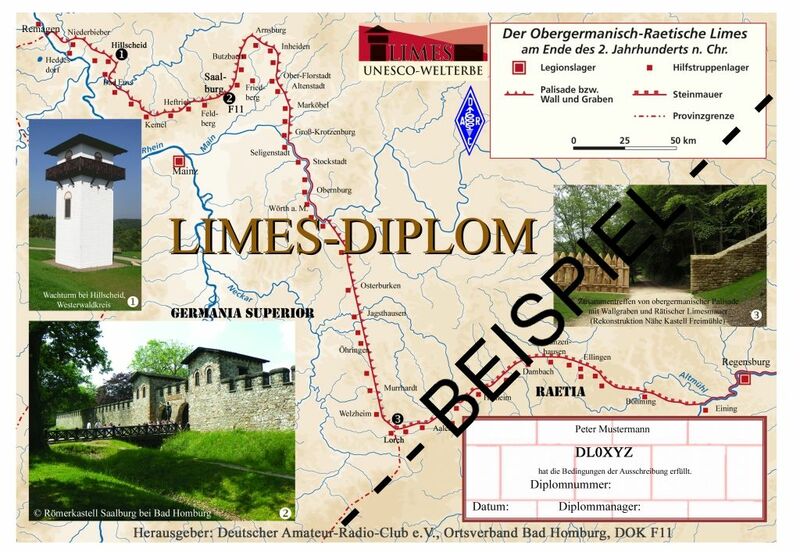 The Limes Award is issued by the local branch F11 located in Bad Homburg of the German Amateur Radio Club (DARC e.V.). It has been recognized as official by the DARC on June 15th, 2010. Applicants may be licensed Amateurs or SWLs. All contacts must be made on or after January 1st, 2010. Each band and mode except packet radio is allowed. Only contacts with stations located at the historical Roman Limes are valid. To achive the Basic Award and the Gladius Award the applicants must fullfill the requirements regarding the number of points, the number of DOK and the number of districts worked. ﻿These stations are identified by its DOK (local area code). Typically a DOK is a three character identification using a letter and 2 digits. The first letter indicates the district, the two digits are the number of the local area. Thus, F11, for example, is located in the district F (i.e. Hessen) and 11 is the number of the local club branch. Additionally, there are special DOK with two or more letters or figures. Any special DOK from a station belonging to the DOK mentioned in thelist can be used as a joker for a missing DOK/district. A current list of accepted special DOK (joker station) can be found in the blue infobox on the right side. The Basic Award is a high quality color print on cardboard. The Gladius Award is a replica of a roman sword made of wood, about 50cm long, with personal callsign engraved. It's not required to work the basic award to obtain the gladius award. The award rules and a detailed list of special stations can be found in the blue infobox on the right side. All applicants must fulfill minimum requirements regarding the number of points, the number of DOK, and the number of districts worked﻿. You can find all details in the award rules (PDF File) in the blue box on the right side. The award must be applied for by a GCR list and a money transfer of the award fee. The application has to be sent to the award manager Klaus Woyczehowski, DL9WO (contact information in the blue infobox on the right side). ﻿The award fee has to be sent by international money transfer or Paypal. The Award (Basic and/or Gladius Award) will be shipped to you as fast as possible. The limes was a border defense or delimiting system of Ancient Rome. It marked the boundaries of the Roman Empire. Certain elements of the line have been excavated, some reconstructed and a few destroyed. The two sections of the Limes in Germany cover a length of 550 km from the north-west of the country to the Danube in the south-east.